Our professionals specialize in eye care services for children and babies. Caring for children’s eyes is known as pediatric eye care. Our pediatric eye doctors and surgeons diagnose and treat childhood eye diseases and disorders. A child’s eyesight develops very quickly in the first months and years of life, so early detection and treatment can mean a lifetime of better vision. When should your child get their first eye exam? We strongly recommend a child receive his or her first eye exam by the age of three. Most developmental eye problems must be diagnosed and treated before the age of five to increase the chances of a full recovery. 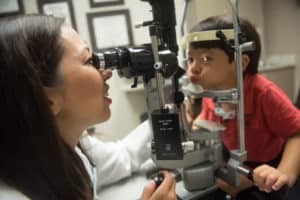 As a parent, what signs should I look for that my child needs an eye exam? What is strabismus, or crossed eyes, and how is it treated? Strabismus is any misalignment of the eyes. It is estimated that 4% of the U.S. population has strabismus. There are many different types of strabismus. Strabismus is most commonly described by the direction of the eye misalignment. Common types of strabismus are esotropia, exotropia, and hypertropia. Strabismus can also be described by its cause. The goal of strabismus treatment is to improve eye alignment which allows for the eyes to better work together (binocular vision). Treatment may involve eye glasses, eye exercises, prism, and/ or eye muscle surgery. Problems associated with strabismus (including amblyopia, ptosis, and cataract) are usually treated prior to eye muscle surgery. Read more here to learn more about Strabismus. What is amblyopia, or lazy eye, and how is it treated? Amblyopia is when vision in one or both eyes does not develop properly during childhood. It is sometimes called “lazy eye.” Amblyopia is a common problem in babies and young children. A child’s vision develops in the first few years of life. It is important to diagnose and treat amblyopia as early as possible. Otherwise, a child with amblyopia will not develop normal, healthy vision. Amblyopia is usually corrected by making the child use their weaker eye. This can be done by putting a patch over the child’s stronger eye. Another way is to make vision blurry in the stronger eye using eye drops. Or the child may wear eyeglasses with a lens that blurs vision in that eye.